Keeping your pet's teeth clean and healthy is about more than fending off "doggy breath"—it's an important part of preventive care. Dental problems, if left untreated, can often lead to serious illness in your pet, due to oral bacteria entering the blood stream and damaging the kidneys, heart and liver. A yellowish-brown crust of plaque on the teeth near the gumline. when the mouth or gums are touched. While a human's trip to the dentist is relatively brief and does not require sedation, your pet's dental exam is considerably more involved and complex. Routine dental cleanings require general anesthesia, and, consequently, a day of hospitalization. Your pet's dental cleaning begins with a physical exam, which is used to evaluate your pet's general health. We also perform routine blood tests in order to detect any potential problems that may result from the use of anesthesia. The first part of the dental cleaning requires the removal of tartar. This is done with a hand scaler. Next, an ultrasonic scaler is used to clean above the gumline, while a curette cleans and smoothes the teeth under the gumline. Your pet's teeth are then polished and the gums are washed with an anti-bacterial solution to help delay tartar build-up. 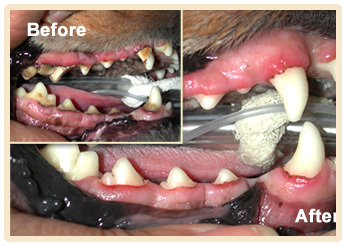 Your pet's dental care doesn't end with a trip to the vet. You can play an important role in keeping your pet's teeth clean at home by brushing your pet's teeth. Our veterinarians and technicians can discuss with you how to brush and care for your pet's teeth at home. Dental care is not something that can be left to periodic visits with your veterinarian. Because plaque buildup (the primary cause of poor oral health) is a gradual process occurring throughout the life of your pet, it is important to practice good home dental care. As with humans, this means regular tooth brushing and in some cases, additional steps may be necessary. Any member of the our staff can show you the proper method for caring for your pet's teeth as well as help you select the most effective dental products for your pet.